Here we have compiled a list of frequently asked questions from families of current and future Marquette students. For further information, select the link at the top of each category to navigate to that department's website. What are the admissions deadlines for Marquette? The priority deadline for undergraduate admissions in December 1st. Applications submitted after December 1st will be reviewed on a space-available basis. See the complete admissions timeline. Detailed transfer and graduate student admissions information can be found at the Marquette Admissions website. See information on how we evaluate your application. My student has been accepted to Marquette University! What next? Congratulations! 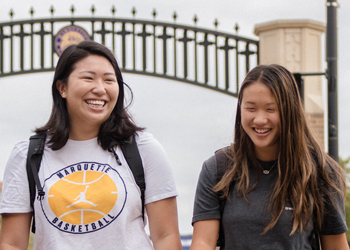 Admitted students who choose to attend Marquette will need to accept their admission, submit their deposit, and sign up for SPARK (Summer Priority Advising and Registration Kick-off). See detailed instructions on next steps in the admissions process. How much is tuition at Marquette University? Undergraduate tuition per year for 2018-2019 is $41,290. See more information on additional costs and fees, as well as graduate and professional program costs. Where can my student find information on financial aid? See financial aid timelines and tips. You can also contact Marquette Central for information on financial aid at (414) 288-4000. Where can I make a payment for my student's tuition and fees? See information and instructions on making a tuition payment. Payment plans are also available for online setup. What resources are available to keep my student safe and healthy on campus? The Marquette University Police Department (MUPD) is present on campus 24 hours a day, 7 days a week, with more than 80 trained professionals and sworn officers. Additionally, Campus Safety provides free transportation services to students on campus and into the surrounding area. Marquette also has a fully staffed medical clinic on campus. Learn more about the services provided by the Medical Clinic. Where can I sign up for campus safety alerts? Students can receive text message safety alerts from MUPD by entering their cell phone number in the "Personal Information" section of CheckMarq. Families of students can find MUPD safety alert updates through the MUPD Twitter account and on Marquette Today. How does my student get involved in campus life outside of class? Students can get involved on campus through joining student organizations, Greek Life, and more! A list of involvement opportunities can be found through the Office of Student Development. Each Fall, an Organization Fest and Community Service Fair (O-Fest) will be held on Central Mall where students can explore involvement opportunities and speak with student representatives! What majors and programs are offered? See a list of undergraduate majors and minors separated by colleges and schools. How can my student make an appointment with their academic advisor? Your student's academic advisor will be housed within the school or college they are enrolled in. The Marquette Academics website provides detailed information about each school and college. Where can I find information about graduation? See information on dates of commencement and mass, applying for graduation, campus hotels and more. The Office of Residence Life provides information on each residence hall on campus. For more information on housing, visit the Office of Residence Life website, or contact them at (414) 288-7208. When is move-in day? Can my student move in early? Residence halls open for incoming students on Thursday, August 23rd (2018) at 8:00am. Students are not able to move-in early, but can sign up for early drop off. Early drop off means that students may drop off a bulk of their belongings in the room between Sunday, August 19th and Wednesday August 22nd to avoid some move-in day traffic. See more information on move-in day and signing up for early drop off. What are my student's off-campus housing options? After their first two years of living on campus, students have a handful of off-campus housing options. There are a variety of University Apartments for students to choose from, as well as a guide to off-campus housing in the surrounding Milwaukee area. You can contact University Apartments and Off-Campus Student Services at muuaocss@marquette.edu or (414) 288-7281. If you are not able to find the answers to your questions, contact New Student and Family Programs in the Office of Student Development at (414) 288-1412 and we will be happy to assist and connect you!